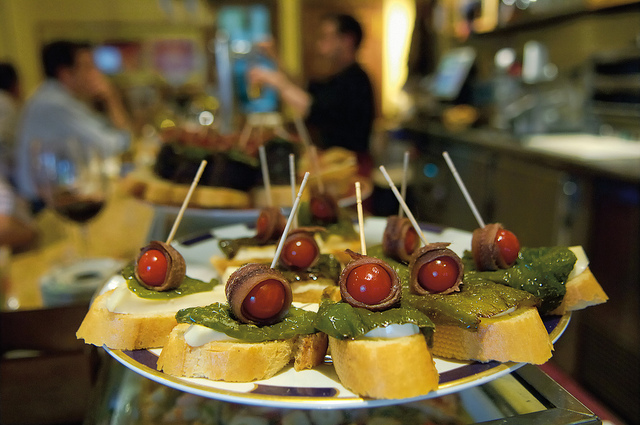 Many people think that tapas are nothing more than a collection of tiny bar nibbles, but in Spain they are integral part of the country’s social life. While Barcelona has in recent year been the go-to Spanish destination, with its amazing beaches and Gaudi’s Gothic constructs, why not buck the trend and sample the tapas scene in Spain’s capital instead. One of the first things to understand about Madrid’s tapas scene is that the locals take their appetites across a few bars. This entry was posted on August 10, 2012 by IndianaJo in Cities, Destinations, Europe, Food & Drink, Travel Style and tagged Alhambra, barcelona, Cervecería 100 Montaditos, El Tigre, Gran Via, La Casa del Abuelo, La Pequeña Graná, Madrid, Museo del Jamon, Spain, tapas, Torre de Oro – Bar Andaluz.